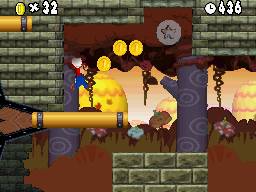 Beyond Super Mario Bros. DS is a hack of a hack. 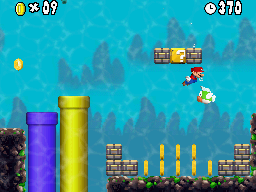 It is based on Newer Super Mario Bros. DS, released at Christmas 2017, to take advantage of the ASM hacks installed in the game such as the minecart and the rotation controller. 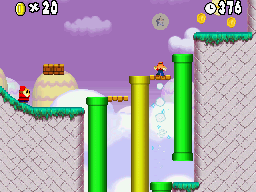 Once ported to the Newer Super Mario Bros. Wii engine, but did not gain as much support. As a result, this hack is still being worked on. 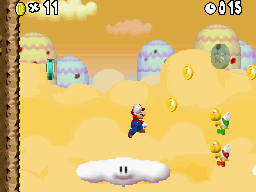 This hack currently uses version 1.06 of Newer Super Mario Bros. DS. 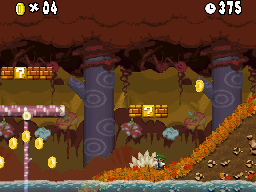 Brand new levels, polished and reviewed before official and public release. 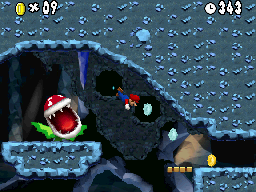 Most of the original tilesets used in Newer Super Mario Bros. DS, with occasional retextured or edited tiles. 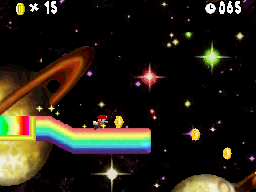 Custom level previews using the template provided by Newer Super Mario Bros. DS, including stage names and screenshots. Release as a full 80-level, 8-world hack if I can form a team. Sorry about that, but it's been 6 months and I only have 9 levels. 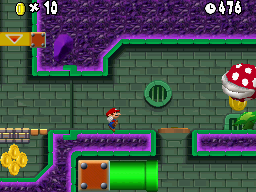 Mechanics from various games in World 7 (secret), but not remakes. Reverse engineering the ASM hacks applied and new sprites used in the original game. Find the locations of newly added files. 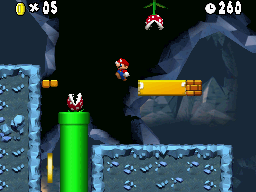 Create various ASM hacks to implement into Beyond Super Mario Bros. DS, suiting the needs of different ideas and levels. If you'd like to apply, please submit a level/video of it made in either SMM, NSMBe, Reggie, CoinKiller, Miyamoto, SMB3 Workshop, Lunar Magic or whatever you have. It must have good level design. If the application is successful, you can choose whether to include the level in the hack or not. Well, since you don't have a real name yet I think it can stay this way, just make sure your final name for the hack doesn't include "Newer". It's not worth Reverse Engeneering NewerDS as we plan to release the source in the future anyways. plan to release the source in the future anyways. That is good. But my ASM Hack Template is some sort of half-working? Last time I tried to import one of the ASM Hack my ROM turned into a 32-MB brick. I have tried to re-download the thing again, but I don't trust it. Also there still is the make clean button which restores your rom. I know we cannot use Newer in the name, but is Another prohibited? 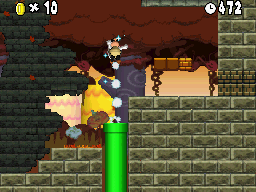 I only saw skawo's cancelled hack Another Super Mario Bros. 2, so nobody is using the word. Can I use Another Super Mario Bros. DS? If you don't understand why we banned the word 'Newer' then you're missing the point when you ask to use 'Another'. Can anyone tell me where is the file to edit the bottom screen logo? Thanks. It is the opening cutscene. No, I have already applied the logo to the file before. That's only for credits? Because the background of that logo is not transparent. Also, I replaced file 2849 and I got the new logo at the start of the credits. After the logo shifted downwards, it became Newer's logo. How and where am I going to edit it? Thanks. 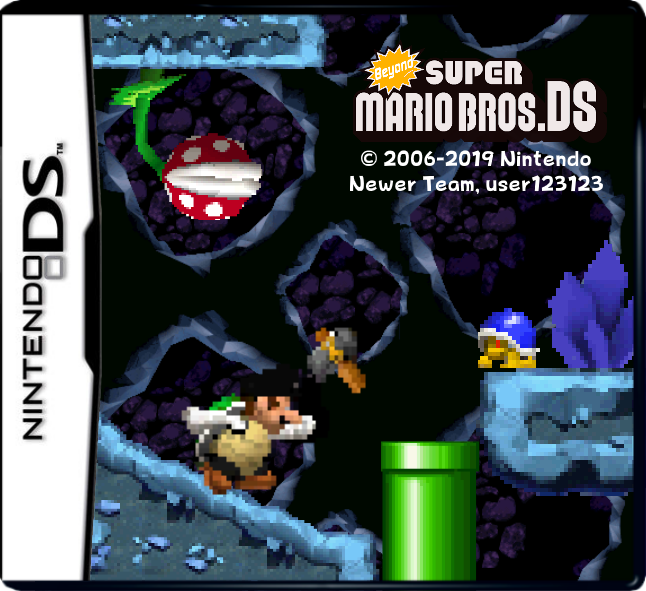 Also NSBTX files are 3d textures which means that the DS could never draw a NSBTX on the bottom screen because in NewerDS only the upper screen is ever set as the 3d engine target. The logo uses the same one used for the credits. Palette/Bitmap/Tilemap should be in the Crdits folder. So I will just focus on levels and stuff. Edit: Anyone knows where is the opening cutscene text? If that is not the one you meant, then I apologise. Edit: I understand now which text you mean, then of course I have no idea where it is stored. Nope. He's hacking the NewerDS rom. The file he got is correct. Maybe MKDSCM can open the map correctly? I don't remember. What do you think about the music in the area where Star Coin 2 is found (YouTube 0:38)? Is it weird? If it is, I will move the entire level to W1-5. It is not possible to have different music when I underflowed the area... So please tell me, thanks. Please tell me about your thoughts. If it is really too hard, I will put it to World 6 or World 1-5. Anyone knows which file does the text belong to? Thanks in advance.